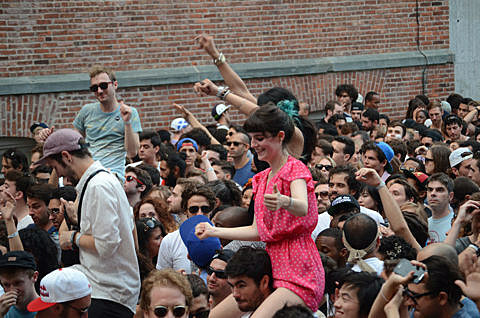 The annual Warm Up summer concert series is returning to MoMA PS1 this year every Saturday from June 29 through September 7. As usual, they’ve booked an excellent lineup of forward-thinking electronic music, hip hop, and other related genres. Artists playing this year include Majical Cloudz (who just played NYC and will play Northside), XXYYXX, Ryan Hemsworth, Liars (live), Kode9, Mr. Muthafuckin’ eXquire, Caribou (DJ), Empress Of, J. Cole, World’s Fair, IO Echo (live), Julio Bashmore, Ben UFO, Gobby, Kelela, Juan Atkins, A Guy Called Gerald, Pional, Kim Ann Foxman, Jon Hopkins, King Britt and tons of other names.